Illinois State University recently celebrated two milestones related to Redbirds Rising: The Campaign for Illinois State. At the end of March 2019, more than 50,000 donors from all 50 states had made contributions to the campaign. The donors are comprised of alumni, friends, corporations, and foundations. Additionally, private support during the campaign has made possible 200 new endowed funds. Endowed funds, established with gifts of at least $25,000, provide permanent support for the University. Each year a distribution, like dividends on a mutual fund account, is made to the donor’s chosen area. Endowments support student scholarships, faculty, facilities, and programs across Illinois State. Of the 50,000-plus campaign donors, nearly 29,000 are alumni and more than 20,000 are friends of the University. Redbirds Rising has also inspired new philanthropy, with nearly 23,000 of the campaign donors being first-time donors to Illinois State. During the University’s past fiscal year alone (July 1, 2017-June 30, 2018), $8.6 million was raised to directly support students and $11.2 million was raised for programs. 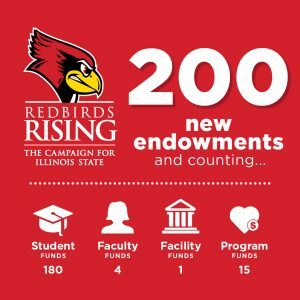 Redbirds Rising, the most ambitious fundraising campaign in Illinois State’s history, began in a quiet phase in July 2013. The campaign was launched publicly in September 2017 with already more than $103 million of the $150 million goal raised in support of the campaign’s three pillars of scholarship, leadership, and innovation. Just a year and a half later, the campaign total is now more than $140 million, 93 percent of the total goal. To learn more about this historic campaign and how you can support Illinois State, visit RedbirdsRising.IllinoisState.edu.